It started with a request from Jean to visit the McCulloch Cemetery. She dropped off the directions for me at the library. The cemetery is way out in the back of an Amish field. I was sure to get lost, so Jean and her brother Guy said that they would take me. I ate a bean burrito before I left and took a Beano so that I would be good company : ) There was no music on the way, just good conversation. Both Jean and Guy grew up in Holmes County, and they know a lot about the history and the cemeteries. This cemetery is located at the end of a field in Prairie County. It is located south of 569. 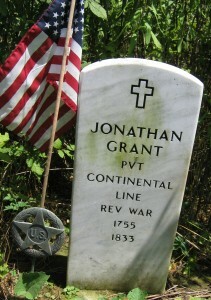 The McCulloch Cemetery is important because Jonathan Grant, the first settler in Holmes County is buried there. You can read more about Jonathan in The History of Holmes County by G. F. Newton. The pictures from our trip are on Flickr. 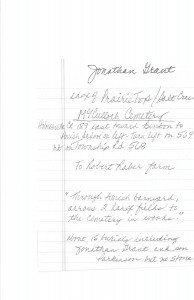 This entry was posted in Cemetery Visits, Lunch and a Cemetery, Prairie Township and tagged cemeteries, Holmes County, Holmes County District Public Library, McCulloch Cemetery, Ohio, Prairie Township. Bookmark the permalink.